For the wine condition, see Bottle-shock. 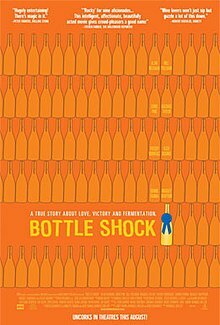 Bottle Shock is a 2008 American comedy-drama film based on the 1976 wine competition termed the "Judgment of Paris", when California wine defeated French wine in a blind taste test. It stars Alan Rickman, Chris Pine, and Bill Pullman and is directed by Randall Miller, who wrote the screenplay along with Jody Savin and Ross Schwartz. It premiered at the 2008 Sundance Film Festival. Sommelier and wine shop owner Steven Spurrier (Alan Rickman), a British expatriate living in Paris, is concerned with how to save his business in his daily conversation with Maurice (Dennis Farina), a wine lover from Milwaukee who is Spurrier's regular (sometimes only) customer. He concocts a plan to hold a blind taste-test intended to introduce Parisians to the quality wines coming from elsewhere in the world. Spurrier travels to the not-yet-famous Napa Valley in search of contestants for his Judgment of Paris taste test, where a chance meeting introduces him to foundering vintner Jim Barrett (Bill Pullman) of Chateau Montelena. Barrett wants no part in the competition, believing it to be a set-up designed by the French to humiliate New World wine producers. Barrett's son, Bo (Chris Pine), secretly passes Spurrier a couple of bottles of the Chateau's chardonnay for the competition. Due to reductionist techniques in wine making (the absence/reduction of oxygen during the wine making process), the chardonnay has turned brown in the bottles, causing Barrett Sr. to call for the whole vintage to be carted away for dumping. But Bo discovers the brown color is only temporary and manages to recover the vintage, thanks to the help of local bar owner Joe (Eliza Dushku) who had intercepted the bottles on the way to the dump. Bo is asked to travel to Paris to represent the Napa Valley vintners at the contest. After tallying the scores from the eight Parisian judges, Spurrier is shocked to find that Montelena has won the Chardonnay competition. The report is featured in an article of Time; restaurants and wine shops all around America are asked continuously for the wine (Chateau Montelena Chardonnay 1973) and forced to admit that they do not have it. This twist of fate and the resultant oenological epiphany forever changes the fortunes of Napa Valley wineries and the global wine industry as a whole, as it is revealed that French wines are in fact not unbeatable. In the end, the futures of the characters are revealed: Jim Barrett continues to make wine into his 80s, although Bo now runs the winery. A bottle of Montelena Chardonnay 1973 and the red wine, Stags Leap cabernet sauvignon 1973, also from California, that had won the same competition were given a display case at the Smithsonian Institution. In 2006, thirty years after the first competition, Steven Spurrier hosted another contest, this time with full confidence that French wine would win. California won again. Steven Spurrier himself has questioned the accuracy of the script while he was involved in another movie project depicting the events of the Judgment of Paris, stating: "There is hardly a word that is true in the script". While the film depicts Gustavo Brambila as being at Chateau Montelena throughout the events leading up to the Judgment of Paris, his 22-year term at Montelena actually began just after the tasting. While at Chateau Montelena, Brambila worked closely with Mike Grgich – who, although not depicted in the film, was the winemaker behind the 1973 Montelena Chardonnay that won in Paris. The film received mixed reviews. Review aggregation website Rotten Tomatoes gives the film a score of 49% based on reviews from 117 critics. ^ "Winemaker Bios: Gustavo Brambila" (PDF). Taylor Family Vinyards. Archived from the original (PDF) on 2011-07-16. Retrieved 2009-03-28. ^ Paulsen, Sasha (August 29, 2008). "Grgich celebrates 50 years of making wine – and history – the Napa Valley". Napa Valley Register.